Call for entries: Brookyn Utopias: In TRANSITion! NOTE: Calls for submissions for the September 2013 show are now closed. Please visit the Upcoming Exhibitions page for more information on the selected artists! 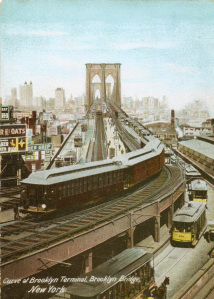 Our newest Brooklyn Utopias exhibition is being planned for September 2013, inviting artists to consider the future of urban transportation in Brooklyn and beyond. We will have a main exhibition in Brooklyn’s Old Stone House & Washington Park gallery and grounds, and satellite public art exhibitions at nearby traffic medians on 4th Avenue in Park Slope/Gowanus, Brooklyn, in partnership with the Department of Transportation. We are now welcoming submissions from artists and organizations, due Monday, July 15! Visit the Calls for Entry page to find out how to get involved in this exciting new Brooklyn Utopias project.